Bring success and happiness to everyday life! Come in today and attend the first course in Scientology. Fill in the reservation form to reserve your space on the course. Your reservation confirmation will be e-mailed to you. The course fee is paid when you arrive to start the course. 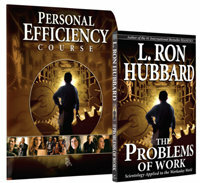 Enrollment on the Personal Efficiency Course includes a copy of the book, The Problems of Work, as well as a seminar portfolio containing a course agenda, glossary and all items needed for the course.